The Xperia XZ1 is Sony's latest flagship, released less than a month ago in the United States. It's probably not the prettiest phone released this year, and it's fairly expensive (like all Sony phones), but it's not a bad device by any means. If you were looking to buy one, you'll be happy to know that it's already $50 off on Amazon (making the total $650). The XZ1 has a 5.2" 1080p IPS display, a Snapdragon 835 processor, 4GB of RAM, 64GB of storage, a 19MP rear-facing camera, a 13MP front-facing camera, and a 2700mAh battery. If you want to hear how all that adds up, take a look at our hands-on of the XZ1 from IFA. This is also the first phone to ship with Android Oreo, and it's compatible with Netflix HDR. 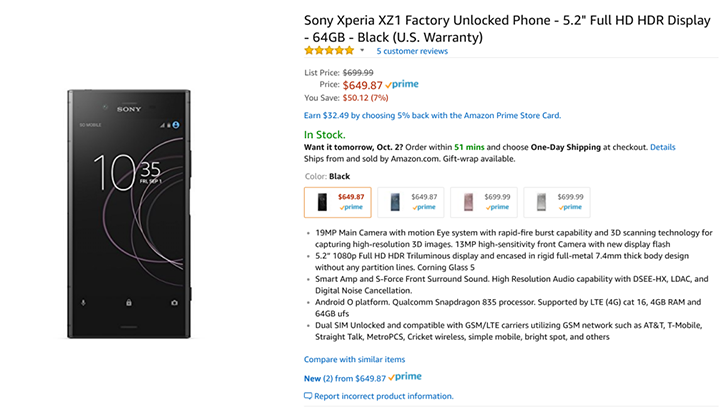 You can buy the XZ1 from Amazon at the source link below. Unfortunately, only the Black and Moonlit Blue colors are on sale.